A quick moving storm system will bring rain to the Finger Lakes on Friday, but will clear out in time for a nice weekend. Rain is moving through the Finger Lakes Friday morning out ahead of a cold front that will push through during the late afternoon and evening hours. The steadiest rain is moving across northern New York, but there are plenty of bands of showers from western New York, across the Finger Lakes and into central and eastern New York. Rain will continue to be likely into the afternoon hours before it starts to taper off from west to east. 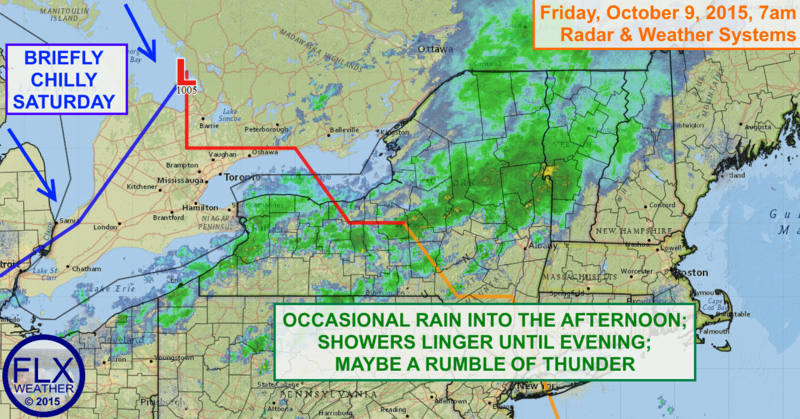 Even after the main batches of rain push east, some showers may linger into the evening, especially across the eastern Finger Lakes and central New York. Once the front pushes through, a chilly north wind will set up. Clouds overnight will counteract the wind to keep overnight temperatures in the mid and upper 40s. However, with the north wind on Saturday, the clouds will have the opposite effect with a cool afternoon. Most places will only reach the mid 50s, but a few upper 50s will be possible as well, especially if the sun comes out later in the afternoon. Any sun Saturday afternoon will transition to some high, thin clouds overnight and into early Sunday. The clouds, along with a shift in the wind towards the south, will again keep overnight lows from dropping too far, with lows in the mid 40s for most areas, but a bit chillier in some of the valleys across the Southern Tier. Clouds should quickly move out Sunday morning, leaving the Finger Lakes to bask in bright, sunny skies. Combined with the steady southerly flow at the surface and aloft, temperatures will rise well into the mid and upper 60s on Sunday. Monday will continue the trend, with most areas eclipsing 70 degrees. A cold front will slide through Tuesday morning with little fanfare, but it will return temperatures to normal levels for the remainder of next week.